A reportable car crash happens every 59 seconds in the state of Texas. In a matter of seconds, your entire world can shift on its axis. The accident might not even be your fault, but that doesn’t mean you won’t have to handle the repercussions—like expensive repairs to your car and/or medical bills. When you contact a lawyer about your wreck, one of the first things they’ll ask you for is a copy of the Texas Peace Officer’s Crash Report or CR-3. Regardless of whether or not you were injured, obtaining this form is crucial to your case. Here’s everything you should know about Texas crash reports, including how to access yours. What is a Crash Report? Anytime an on-duty police officer shows up at the scene of a crash, Texas law requires that they must fill out a crash report, also known as a CR-3 form, if there’s been a fatality, injury or property damage of at least $1,000. These reports are filed and submitted within 10 days of the accident by a peace officer. There’s a reason why the CR-3 form is so important to your case: not only does it contain detailed information about the collision, but also the officer’s opinion of the scene. If you’ve been a car wreck that may have resulted in damage or injury, the first step you should take in the process—before accessing your crash report—is contacting us at Hutchison & Stoy. We’ll walk you through the complete procedure, and answer any questions you might have. Can I Get a Copy of an Accident Report in Texas? These restrictions help protect from random strangers from obtaining your CR-3 form and reading the private information on it. You can obtain the TxDOT crash report up to 10 years after the accident, although you’ll usually need it a lot sooner. As long as you fit the above requirements, you can obtain a copy of your collision report. However, to do so, you’ll need to request the form online or by mail, and pay a small fee. When you obtain your CR-3 form, you might feel lost. In many cases, officers might use shortened abbreviations and numbered lists. To someone who isn’t a traffic officer, parts of a CR-3 form might look like gibberish. Fortunately, you can decrypt their code easily–all you need is a copy of the Texas Department of Transportation’s official code sheet. There are actually two different kinds of crash reports: CR-2 forms and CR-3 forms. If someone says, “crash report”, they could be referring to either form. Although they might sound similar, there are quite a few distinctions between the two types. The severity of your accident will determine which report you should use. While a police officer must submit a CR-3 form, someone involved in an accident will file a CR-2 form. Blue forms are generally used in accidents where the police aren’t called to the scene. In some accidents, bodily injuries and damage might not always be immediately noticeable. Your adrenaline is pumping, and you might not realize you’ve got a serious injury like internal bleeding, whiplash, or a tear in the muscles. Even fender benders that seemed like no big deal at the time could end up costing thousands of dollars in medical bills and vehicle repairs later on. If the police weren’t called at the time of the accident, you’ll have to file a Texas blue form. Or, if an officer did show up but didn’t fill out a CR-3 form, then submitting a CR-2 report is your responsibility. 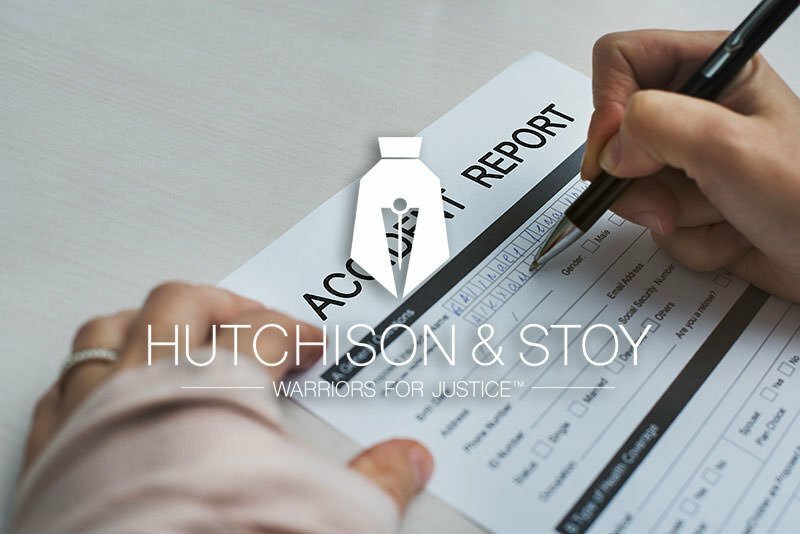 Keep in mind that, before filling out any forms, you should always get in touch with the lawyers at Hutchison & Stoy first if you’ve sustained a personal injury. Automobile accidents can be physically and emotionally damaging, and you might not be aware of all your rights. We’ll walk through the process together and help get your life back on track. How to Fill Out and Submit Crash Report Online in Texas? CR-2 reports can be filled online through the TxDOT website. There’s a different blue form for every year, so you want to make sure you fill out the CR-2 version from the year of your collision. If your accident happened two years ago, you should use the blue form from two years ago—not the current one. When you sit down to complete the report, make sure that you install the most current version of Adobe, or use Internet Explorer. If you’re using a Chrome browser, you might have issues opening the form. Something to keep in mind when filling out your blue form is simplicity. Even if the accident was the result of another driver’s mistake, your CR-2 is not the place to rant about the hazards of distracted or drunk driving. It’s a lot more helpful for you to explain the accident as a simple, factual chain of events. Although the blue form is a chance for you to tell your side of the story, you want to provide as much of an unbiased perspective as possible. It might be helpful to try and envision the accident through the eyes of a traffic officer. How Long Do I Have to File a Crash Report? Like police officers who submit CR-3 reports, you need to file your blue form within 10 days of the accident. If a Texas officer is already submitting their report, there’s no need for you to fill out your own crash report—unless you’d like to for your personal records. There are penalties for failing to submit a blue form within the deadline, but only if the accident resulted in death, injury or $1,000 worth of property damage. Fender benders where there is no damage or injury are not worth reporting, but an accident where there’s significant property damage or an injured party is definitely worth filling out a crash report for. Don’t forget that, in the case of personal injuries, not all physical traumas present themselves immediately. You might believe that you’re fine, and then begin experiencing symptoms a couple of days later. This is why it’s important to be aware of any medical issues that arise after the accident—you might think you don’t need to file a blue form when the reality is that you’re seriously injured. If you don’t call the police and fail to report the wreck, the state of Texas could suspend your driver’s license. It’s important to remember that, in some cases, you might not be the one filling out and submitting your blue form. Your insurance company, legal representative or owner of the vehicle could also complete the CR-2 report and submit it. Minors, for instance, would rely on a parent, guardian or vehicle owner to file their blue form. Car crashes can be traumatizing—not only do they often have financial repercussions but in some cases, they result in an injury or fatality. Trying to handle these consequences so soon after the accident can be difficult, but the good news is that you don’t have to do it alone—we can be there every step of the way. If you were involved in an auto accident, the Fort Worth car accident lawyers at Hutchison & Stoy can help you throughout the process. Our team of experienced attorneys will file all the paperwork, talk to the various insurance companies, and make sure you get the proper treatment. If you have any questions, contact our team today or fille out the free case evaluation form to talk to an attorney today. Hutchison & Stoy is a team of dedicated attorneys that are here to help you get the justice you deserve.